Misaki has Type1 diabetes. She loves satsumas and in winter she eats three satsumas every day. The worst thing about her illness is the daily injections. Having to inject herself at school every day is very troublesome for her. Her dream for the future is to work in a cat café or an ice cream shop or a pharmacy. (“Actually, I think it might be fun to have a job in a gas station…”) (Laughs). If her diabetes could be cured, Misaki would love to be able to spend time with her school friends and eat whatever she likes with them without having to think about her shots. 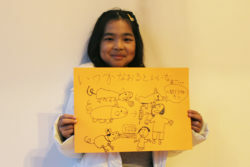 If you would like to help Misaki to be able to eat whatever she likes without having to worry about her insulin shots, then please take part in our initiative to eradicate Type1 diabetes through the “Furusato nozei.” (Hometown tax). The “Furusato nozei” (Home town tax) is a scheme whereby taxpayers can choose to divert part of their residential tax to local government bodies in Japan (prefectures, municipalities). If you make a donation to a local authority of your choice and declare this on your tax return, the tax you have to pay is reduced by an almost equivalent amount, up to a certain limit. If you donate more than 10,000 yen, we send you a “Thank you” gift of your choice. * You can also opt not to receive a thank you gift when you donate. Type1 diabetes is an autoimmune disease that can develop very suddenly, regardless of one’s lifestyle. It is thought that there are approximately 70,000 patients nationwide. The only way in which Type1 diabetics can carry on with their lives is to continually supplement their insulin levels through daily injections (insulin is a unique hormone that controls blood glucose levels). At present, this is a disease which cannot be cured through medical treatment. 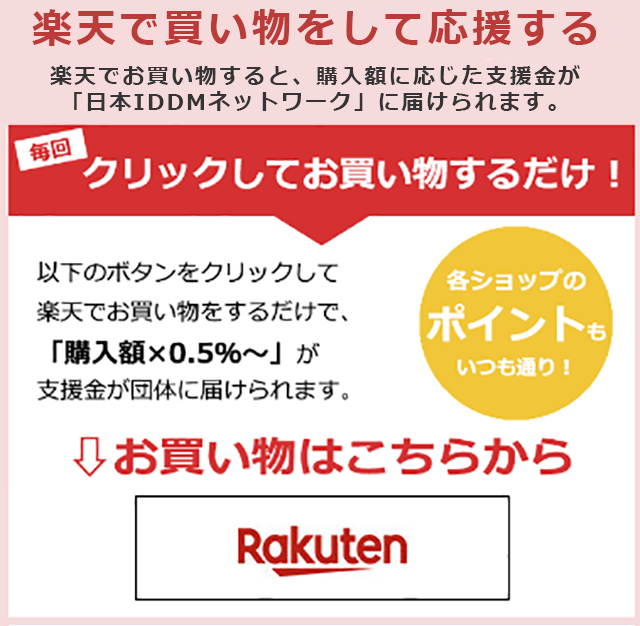 The Japan IDDM network is an accredited NPO (Non-profit organization) that supports patients and families who need insulin supplements for their daily lives, for instance for Type1 diabetes. Its ultimate aim is the eradication of Type1 diabetes (Cure + Treatment + Prevention). Its more immediate objective is to make Type1 diabetes a “curable” disease by 2025. However, research into treatments such as islet cell transplants is making steady and gradual progress. We are now near the stage where the “despair of never being able to cure this” turns to “hope that we can find a cure”. Your donations are used to fund research and to support other initiatives to achieve the eradication of Type1 diabetes.